By Brian Voo in Mobile. Updated on March 10, 2016 . 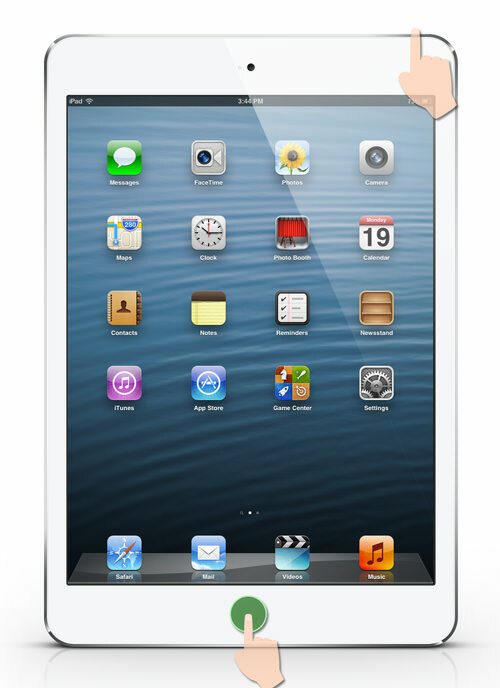 The newly launched Apple iPad Mini is out to have a beat down with other tablets in the market. If you have jailbroken your iPad Mini and have run into problems, there is probably a need for you to restore your iPad Mini to its original factory settings. Restoring the iPad Mini to its default settings is also essential if you are thinking of selling or giving away your iPad Mini to someone else as you can fully erase your personal info from the device before it leaves your hands. Here are 2 simple ways to restore factory settings and erase all the content on your iPad Mini, with the help of iTunes, and without. It is just as simple to restore your iPad Mini without iTunes. Go to Settings > General > Reset and tap on Erase All Content and Settings. You’ll then be asked if you want to continue; after the confirmation, your iPad Mini will reset and the Apple logo together with a loading bar will appear on screen. Upon the start up, all content, apps, music, photos, and personal account information will be erased from the iPad Mini. And you’ll have to go through the process of setting up the device from scratch (choosing language, Apple ID, etc.). Start by connecting your iPad Mini to your desktop computer with the provided cable. Start iTunes. 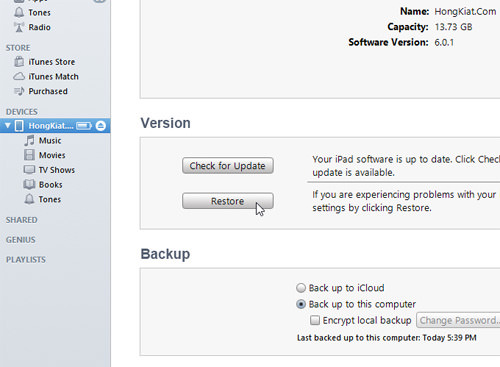 Locate your iPad Mini under ‘Devices’ on the left panel and click on Restore. If this is your first time restoring, you’ll have to wait for the firmware file to be downloaded. Once it is downloaded, it’ll ask if you really want to restore. Confirm to proceed. Once your iPad Mini starts up again, you’ll have a clean iPad Mini with the latest firmware installed. 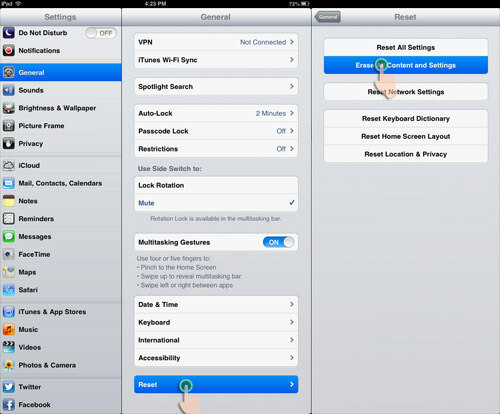 Here are a few more handy tricks to troubleshoot your iPad Mini. If you find your iPad Mini frozen (hang) due to app failure and nothing you do changes anything on screen, you can try a force reboot. Simultaneously hold down the top power button and center home button of the iPad Mini until you see a black screen. Remove your finger only from the home button. Continue pressing on the Power button until the Apple logo appears on screen. Once it appears you can release your finger from the power button and wait for the device to start up. 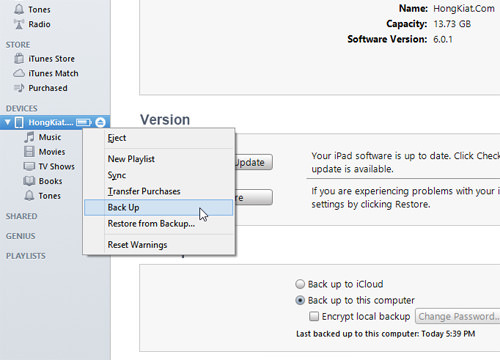 This process of forcing a reboot will not delete any of your personal information from the iPad Mini. This is just a way to restart the device when it starts acting wonky. If you work on the iPad Mini or use it extensively to store your information, you should constantly backup your information. In the event you need to restore your device but still want all your personal information, you can choose to restore from a backup. These same tips also work for all your iOS devices. Do you experience any other problems with the iPad Mini or have tips on how to fix some of these problems? Let us know in the comments.